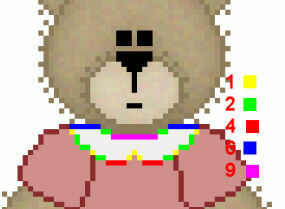 I don’t want to convert my dress to a raster yet, because I may be making some changes so add a new raster layer, and drag this above your bear layer. Click on your bear layer and select your preset shapes tool. Pick Ellipse from the shape list, same settings as before including outline color, and draw an ellipse on the left side of your bear starting at 132x131 and dragging it to 148x147. We need to rotate this a little so our top node is at 143x132 and our bottom node is at 137x147. Click the node on the left side and drag it to 130x134. Click your bottom node and pull the left handle to the left in a fairly straight line a few pixels until the outside edge of your sleeve is covering your bear’s arm. If I hover over my handle, I’m at 121x139. Click the top node and pull the left handle up a couple pixels. If I hover over my handle, I’m at 139x128. We don’t have to worry about the right side of that sleeve because it’s going to be covered by the dress, but if you want to save it as a preset shape and make it look more even, click the handle on the right side and pull it down a little so your outside edge lines up with the bottom of you sleeve. If I hover my cursor over my handle I’m at 145x150. If you like how your sleeve looks, rename the vector layer and save it as a preset shape. Now we need a right sleeve. This is going to be easy because all we need to do is copy our left sleeve. Since I like my vectors on their own layers, I’m going to add a new vector layer and call it right sleeve. I don’t have to put a raster in between since I added a new vector layer. Click on your left vector sleeve layer and go to edit copy. go to edit paste as a new vector selection. Our sleeve is backwards so we need to go to Image Mirror to make it a mirror image of our left sleeve. Position the sleeve on the right side. It may not line up exactly as it does on the left side, since our dress might not be shaped exactly the same on both sides. I like things the same though, so we’ll be fixing all that before we’re done using pixels. If you want, you can fill in the color for the sleeve. If it's still a vector layer, click on each vector layer, right click, properties, and change the fill color from null to your fill color. I used #e6e4e0 but you can use any color you like. Now click on your dress layer and change your foreground color to the color you want the outline of your collar to be. Change your background or fill color to the color you want your collar to be. Set your preset shape tool to ellipse with the same settings as before and starting at 138x130, drag your cursor to 162x137 to form an ellipse. Click on the left node which should be at 138x134 and pull it up to 137x130. Click on the right node which should be at 162x133 and pull it up to 163x130. Click on the top center node which should be at 150x130, and pull it down 2 pixels to 150x132. Click on the bottom center node which should be at 150x137 and pull this up 2 pixels to 150x135. Click the right handle on your bottom center node and pull it down about 6 pixels. If I hover over my handle, it’s at 157x141. Click the left handle on your bottom center node and pull it down about 6 pixels. If I hover over my handle, it’s at 143x141. 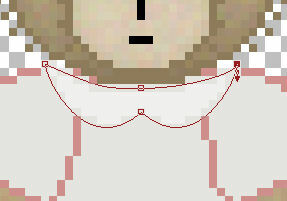 I think my collar looks too big so I’m going to grab the top center node and bring it down one more pixel. I’m still not satisfied with my collar but since I have the basic shape for my collar, I can fix what I don’t like using pixels. If you want to use my collar outline, I’ve colored the pixels accordingly and you'll notice she has a different color dress on. I thought about giving her a darker dress and changed my mind but after I did this collar outline. I think we’re done with our vectoring. Any adjustments that need to be made can be done with pixels. I like everything even so I’m going to decide which side of my dress parts I like the best, and pixel the other side to match. If you’re pretty happy with the way your dress is coming out, you don’t need to do this but I like everything even. Convert each vector layer to a raster by right clicking and clicking convert to raster layer. If you’re not going to adjust any pixels, you can skip over this next part and start the shading. Turn off your collar and sleeve layers and click on your dress layer. Be sure you’re zoomed into 800%. Decide which half or which sections of your dress look the best and adjust your pixels on the opposite side to match. You may like parts from both sides of your dress so erase or pixel accordingly. You can do this adjusting one of two ways. Select your paint brush with these settings. Square size 1, Hardness 100, Step 25, Opacity 100. This is the settings we’ll use for all pixels. Set your foreground color to your outline color and set your background color to your fill color. Click on your dress layer and add pixels or remove them. If your fill needs to replace a removed pixel, switch colors or go from righting clicking to left clicking. If you have to erase, switch to your eraser tool and be sure you choose size one, just as you did for your pixeling. A second way to do this would be to add a new layer and just pixel over your entire outline, using the pixels that look the best. then adding yet another new raster layer and switching back to my outline color. It’s a lot of extra work but I find it less confusing. Plus it saves me messing up my original dress outline, just in case I need to go back to it for some reason. I used several different outline colors, so I can show you how many pixels I used. When you’re done fixing the pixels on your dress, turn on your two sleeve layers. You can keep your dress layer on because this will help you decide if you need to fix any pixels by the arm pit area. I’m kind of happy with my sleeves but I did notice the right is a tad different from the left sleeve so I’m going to just make it match up to the left sleeve. Since it’s so minor, I won’t be giving you a screen shot and if you have to make any adjustments, you’re on your own for this one. We’ve already adjusted our collar so let’s move onto the shading. All graphics hand drawn by Sheryl. Please don't take anything from this site and call it your own.